Alizarin Crimson is the oldest synthetic deep red-crimson pigment. It is a lake pigment which when applied in strength and kept from the direct sunlight will last for many decades. Alizarin is a treat to paint with, just the sheer joy of the depth and uniqueness of color is invigorating. A beautiful bluish-red pigment from the staining family, Alizarin Crimson is listed on the basic palette of a vast majority of artists. 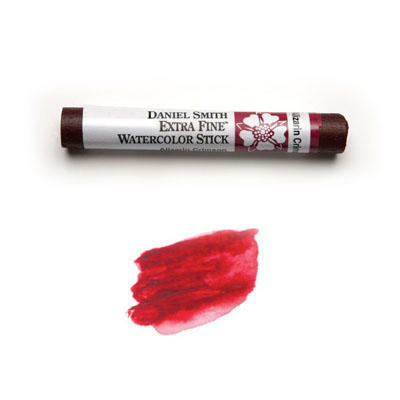 Intense and dark in value, Alizarin Crimson mixes cleanly with most pigments to create dark mixtures and warm neutrals. A combination of Aureolin (Cobalt Yellow) and French Ultramarine with Alizarin renders a surprising range of other colors resembling everything from Burnt Sienna and Umber to Payne’s Gray, while Alizarin Crimson with French Ultramarine creates an intense purple.